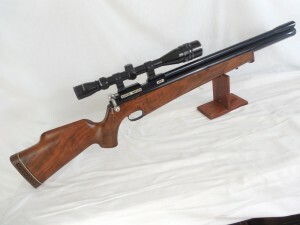 I’d like to take some time to share with you pictures of an extraordinary collection of air rifles.
. I am in the process of researching the history of these guns and would like to determine the dates of mfr, cost new and the current value. If you have information or experience with these guns, please send your comments. I received a call some time back from a man who said his brother had died and left him a collection of airguns. He asked if would I be interested in them. I asked him to send some information and I would take a look. I get these calls from time to time and expected to receive pictures of the typical Daisy and Crosman airguns. I was surprised. The results were eye popping. 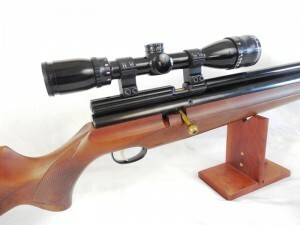 This was not your typical airgun collection. This man was was a connoisseur of fine airguns. The collection consisted of 12 high end airguns. 2 German 10 yard target tifles and 10 English Field Target guns all made between about 1995 and 2005. There were 3 Ripleys, 4 Daystates, a Webley Venom Viper, An Air Arms S 410, A Titan / Falcon and 2 FWB 300. 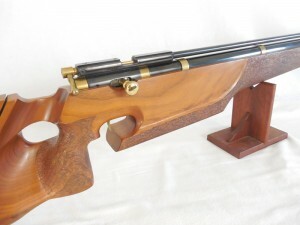 Not only were these very high quality airguns but several of the stocks appeared to be custom made. the color and figure and sometimes the shear size of the wood stock was astounding. Several of these guns were true works of art. I really though that these were beyond my budget. My wife was sure of it….But, one day a couple months later, Mr Powell called again and asked if i was still interested. We were able to negotiate a deal and I got the collection. 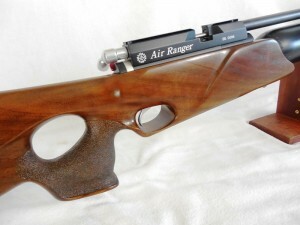 The worst one is still a very cool airgun. 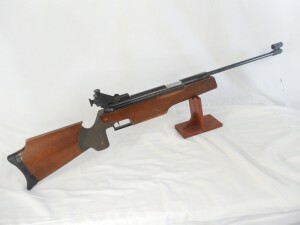 There were two Feinwerkbau ( FWB) Model 300 10 yard target rifles. 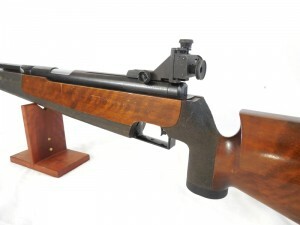 These guns are recoil-less and the entire receiver moves to counter the recoil. This one is a little plain Jane. 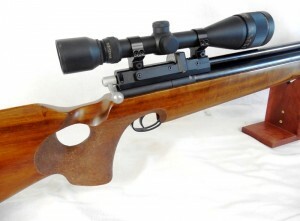 The second FWB 300 appears to be a little newer and has a nicely figured stock. These are so much fun to shoot. Smooth and accurate. 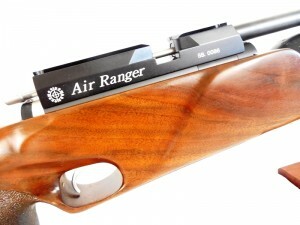 From there the airgun coolness index increases dramatically. 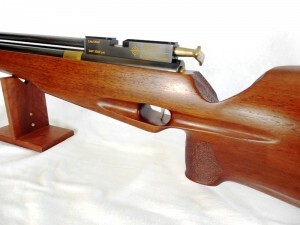 Air Ams S 410 Extra FAC , .22 caliber, 10 shot repeater, Walnut Stock. 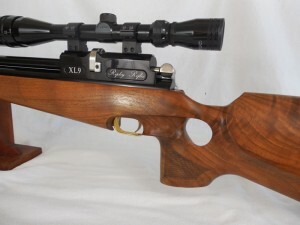 This is a great air rifle. I had the AA S 510 .22 cal. repeater and the S 500 single shot is one of my favorites. 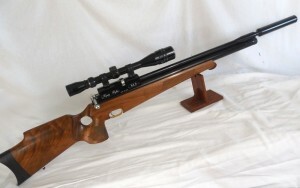 The Webley Venom Viper .22 caliber, single shot, PCP with Swift 4-12 x 40 AO Scope. 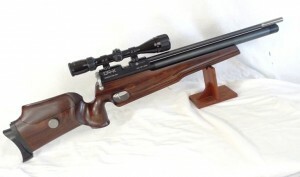 This rifle was made in England around 2002-2004. 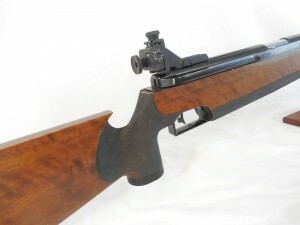 The most popular version was a rifle with a two shot clip called the Raider that was made in their factory production. 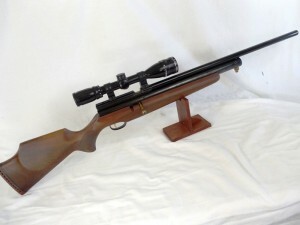 This rifle, however, is the single shot version. 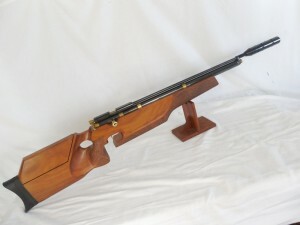 They sold only a few and these were made individually in their custom shop by the legendary master gunsmith, Ivan Hancock. I think this is a Titan or Falcon. Research is still ongoing. Feedback from those familiar with this model would be appreciated. 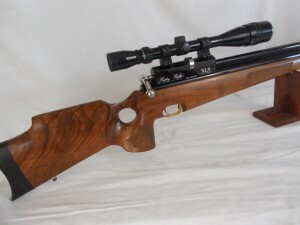 It has a massive walnut stock. Probably from the late 1990’s. There were four Daystates. The earliest was a Model C94. This is a .177 caliber, single shot, PCP that was made from 1994 to 96. 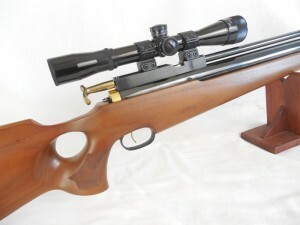 The Blue Book of Airguns says that only 60 were made. 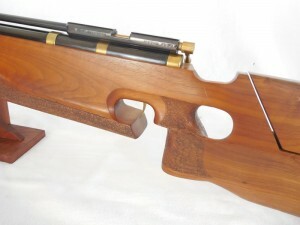 I was told that this may be a Gary Cain custom stock. 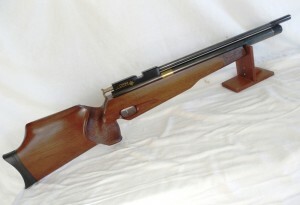 The Model 94 quickly evolved into the Model 97. 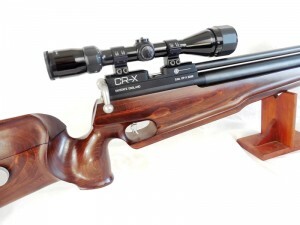 The Model 97 evolved into the Daystate Model CR-X. 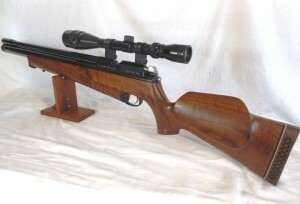 Made from 1999 to 2003 this one is a .177 caliber, single shot PCP with a adjustable poplar stock. One interesting thing about this collection is that even though most of these guns were designed for field target use, all of the scope were duplex reticule, not a mil-dot reticule among them. That and the fact that many of these guns were .22 and .25 caliber make me think that Mr. Powell was more interested in hunting that with field target competition. 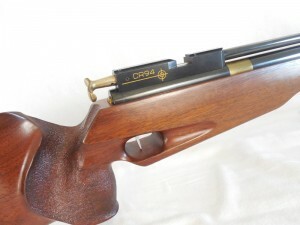 The remaining two Daystate airguns are both .25 caliber. The first is a Daystate Air Ranger. .25 caliber, 10 shot repeater, left hand bolt, 836 fps. 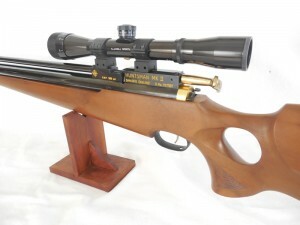 The last Daystate is a Hunstman MkII. This is a .25 caliber, single shot with either a BSA or Walther barrel. Made from 1995-2002. 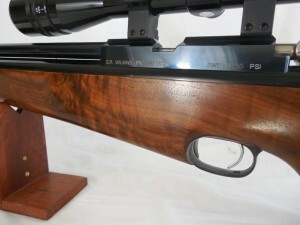 The remaining three rifles were true works of art from the Steve Wilkins at Ripley Rifles. 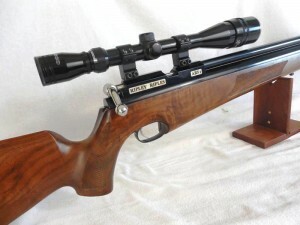 Ripley Rifles was owned and operated by Steve Wilkins, son of the famous Joe Wilkins who manured the Predator rifle and had a significant role in developing the modern PCP air rifle ( Blue Book of Airguns) Ripley rifles was located at Derbyshire, UK. 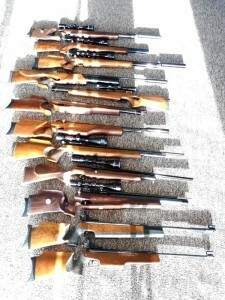 These were mostly custom rifles, some with Paul Wilson custom stocks. No pictures available of the AR-4. Thanks for stopping by. I enjoyed sharing this with you and would appreciate your feedback and comments.